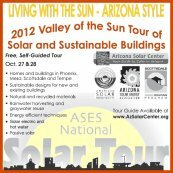 The annual, long running Valley favorite, and part of the National Solar Tour put on by the American Solar Energy Society, is a free, self-guided tour of solar and sustainable buildings offering the public access to a dazzling variety of technologies and strategies for wise energy and resource use and desert appropriate, environmentally responsible living in central Arizona. This year's tour will provide the community with the wonderful opportunity to see and learn from a wide range of buildings, from grid-tied homes to commercial infill projects. Locations will showcase a variety of sustainable building designs, materials, systems and technology, including passive solar, solar PV, solar thermal, rainwater harvesting, graywater reuse, energy efficiency, and the use of materials from conventional to straw bale construction. Discover ways to reduce your utility bills and carbon footprint while having fun touring innovative sustainable homes and buildings as well as learning from local homeowners and building experts. An architect's green and sustainable home designed for the desert; and so much more! Talks at each site will be scheduled on-the-hour with a noon-time break. 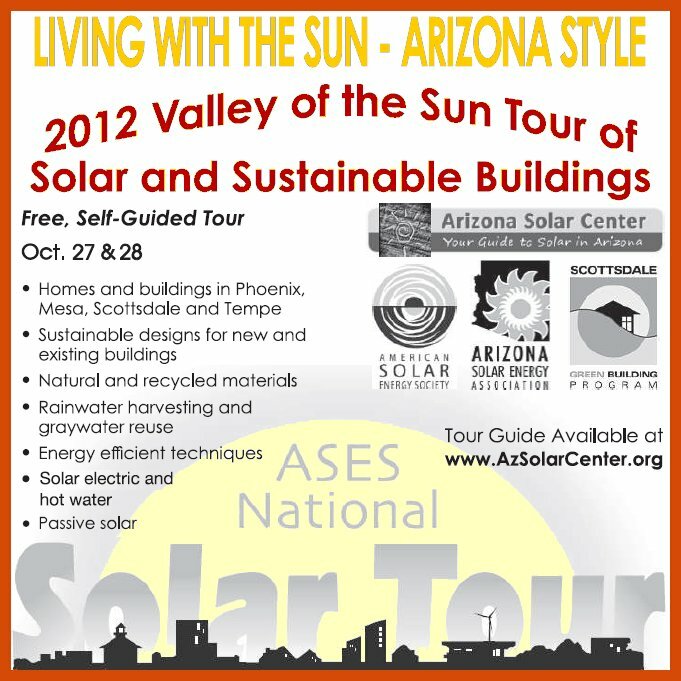 This free, self-guided tour is organized by the Arizona Solar Energy Association - State Chapter of the American Solar Energy Society (the nation's largest and oldest solar and sustainability membership organization); Arizona Solar Center, Inc. - The solar and sustainability non-profit collaborative and home of the state's go-to website for solar and sustainability information; and the City of Scottsdale Green Building Program.